In 1988, the decision was made that Action Comics would be published on a weekly basis and would be retooled as an anthology series. Co-editor Brian Augustyn was brainstorming different ideas for features to fill the weekly series, and the revival of El Diablo was born. However, this was going to be a new take on an old character. El Diablo (created by Robert Kanigher and Gray Morrow) first appeared in All-Star Western #2 (1970), operated during the American Old West (~1866 AD) and appeared in DC Western titles sporadically throughout the 1970s and early 80s. Essentially, Western El Diablo was a masked cowboy who was possessed by a demon spirit and battled evil - a cowboy/vigilante series mixed with some supernatural elements. 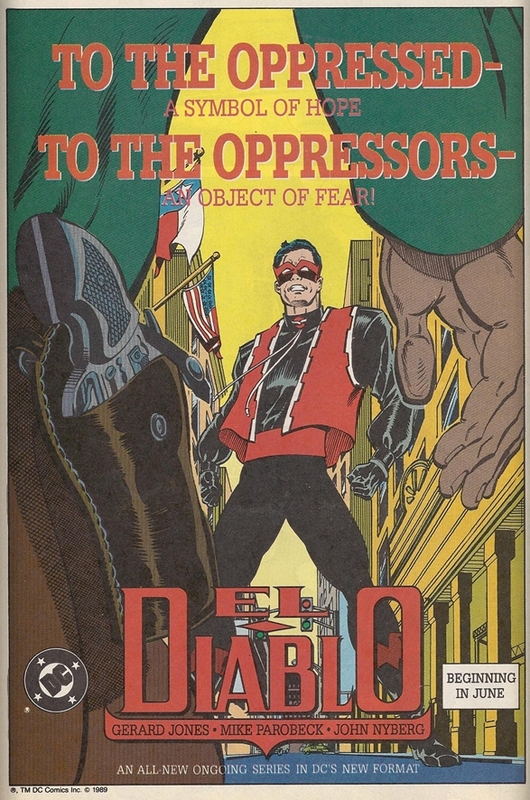 This new El Diablo was a completely different character with no connection to his predecessor: his adventures would be set in a modern day (late 80s) Texas border town, he had no super powers or supernatural connection, and he was Hispanic. The Action Comics Weekly series reverted back to a monthly title starring Superman by the time the concept and creative team for the new El Diablo feature was assembled, but DC gave them the green light to go ahead and create a new ongoing series for El Diablo regardless. In this ongoing series, El Diablo was the alter-ego of Rafael Sandoval - a Mexican/American city councilman - who decides to become a masked vigilante when he feels the system is failing the people. As previously mentioned, El Diablo has no super powers, so he’s more or less a masked adventurer rather than a super-hero. The non-super powered vigilante fighting street-level crime was a popular trend in comics at the time (as seen in Green Arrow, Batman, the Question, the Huntress, etc…), but El Diablo did it a bit differently - he was a vigilante who acted on a need to serve his community (as opposed to a vigilante with a personal vendetta to fulfill). While that may not mean anything significant to anyone reading this review, the setting is just as important as the character itself - El Diablo operates in a multicultural (African Americans, Hispanics, Caucasians) hotspot and spends most of the series trying to prevent the different communities from going to war with each other and band together against the real villains (i.e. : drug lords and political manipulators). Combine this with the fact that most of the stories deal with real-world issues such as the drug trade, landlords vs tenants, big business vs poor working class, human trafficking, illegal immigrants stealing American jobs, and you’ve got yourself an extremely socially-conscious comic book series. As you can guess, this series is steeped in realism - El Diablo is aware that it’s a bit nuts to be a costumed vigilante, sometimes El Diablo loses a fight, sometimes the villain gets away, and sometimes it’s not always obvious who the real villain in the story is. Many readers compared El Diablo to Will Eisner’s the Spirit, but I’ve never read the Spirit, so I can’t confirm or refute that claim. One of the most surprising details about this series is that nobody on the creative team was Hispanic - writer Gerard Jones (better known for co-writing The Trouble with Girls published by Eternity comics) is a Caucasian from California, artist Mike Parobeck is a Caucasian from Illinois and editor Brain Augustyn is also Caucasian. Not that it really mattered since (according to the Latino readers) they still managed to hit it out of the park as far as ‘keeping it real’. Part of this had to do with Jones staying as far away as possible from racial typecasting when writing the characters, yet staying true to their culture. Jones even went so far as to add Hispanic dialogue to several issue without any subtitles so those of us who don’t read Spanish were clueless as to what was being discussed. Jones’ original intent for this series was to cast a new and more humane light on the icon of a costumed vigilante and to create a “believable” city that functioned as a realistic human community (not just a metaphorical “urban hell” as depicted in most other vigilante books). The citizens of the story were just as important as the vigilante himself, since the masked hero is a symbol intended to unify “the people”. Within the first few issues of the series El Diablo manages to recruit a gang of youths (called the 'Los Diablos’) to work as street operatives - Jones stated that this was a homage to Jack Kirby’s Newsboy Legion concept from the 1940s. The El Diablo series more or less operated in a self-contained universe as Batman, Superman, the Teen Titans or the Justice League are never mentioned. El Diablo, however, did refuse a Justice League membership in Justice League America #42 (1990). Surprisingly, a DC Western character does appear later on in the series, but not the one you’d expect… the Vigilante (Greg Saunders) appears in El Diablo #12. If the Greg Saunders Vigilante doesn’t mean anything to you, that’s because you are probably too young to remember him. Greg Saunders was a DC Western character from the 1940s who rode a horse and sang songs, and after a 40-year hiatus was suddenly appearing sporadically throughout the Earth-Two titles (i.e. : All-Star Squadron, Young All-Stars, Infinity Inc) in the 1980s. A pretty obscure character to make a guest appearance, in my opinion. Maybe because El Diablo operated out of a Texas border town? El Diablo, while intelligently written, did not have strong sales. It probably shouldn’t have lasted longer than 12 issues, but the creative team was given an extra 4 issues to wrap up any dangling plot lines. Apparently, in a demonstration of 'sticking to story integrity’, the creative team opted to follow their original story rather than changing their format to meet public demand. SPOILER: The series ends with El Diablo retiring from vigilantism and going back to being a full-time politician - his parting message being that we can all be heroes by raising our voices and speaking up in a public forum in defense of our values. Interestingly enough, this was not the ending Jones had originally planned on writing, Jones just wanted to give the reader some sort of resolution. As detailed in the letter column of the last issue, Jones still had plans for El Diablo and was hoping for a mini-series or one-shot to explore these stories (but it never happened). It was suggested by readers that the reason the series struggled in sales was because the main and supporting characters were Hispanic. The fact is: El Diablo was the first Hispanic DC character to receive his own ongoing series. Latino superheroes were somewhat sparse and under-represented in the pre-1990s DC universe. Notable Hispanic characters include El Dorado (appeared in Super Friends cartoon during late 70s), Fire/Green Fury/Green Flame (first appeared in a 1979 Super Friends comic), Vibe (a member of Justice League Detroit in the mid-80s), and Wildcat II (member of Infinity Inc in mid-80s). Is there any truth to this theory? Jones had smugly stated in the letter column of El Diablo #16 that the series got more attention in “real world” journalism than the comic book press. He also publicly thanked Vista, Hispanic Magazine and Texas Monthly for drawing positive attention to the series. After all but disappearing from the DCU after his series was concluded at issue #16, El Diablo’s last modern day appearance was in an Infinite Crisis one-shot in 2006.